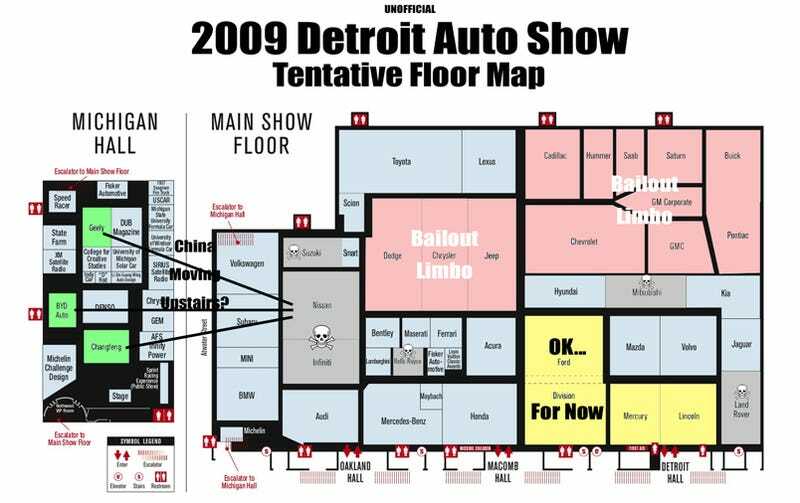 With today's news that Nissan's dropping out of both the Detroit Auto Show and the Chicago Auto Show, joining a slew of other automakers fearful of the Carpocalypse, we figured it was a good day to take a look at what the Detroit Auto Show floor may look like come January. Frankly, there's some pretty big holes up there on our map. We don't have the foggiest idea what's going to happen with a few of the big names — specifically Chrysler and GM — and we also don't know what this means for some of the other more "alternative" names — like Changfeng and the rest of the Chinese takeout menu of minor up-and-coming automakers. Take a look and tell us if we're missing anything. We'll update the floor map as we hear more.